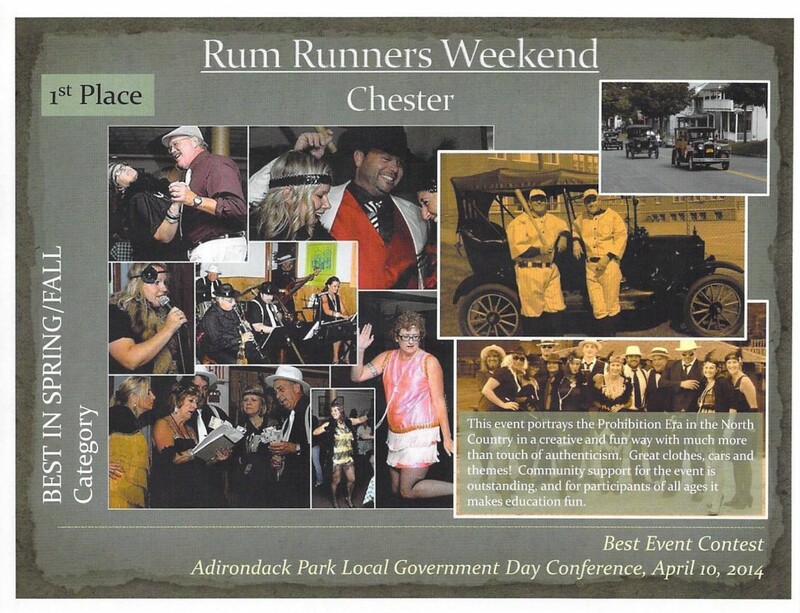 The Alliance organized Rum Runners Weekend, held in mid-September, where the entire community joins in the festivities to celebrate the Roaring Twenties. The Town of Chester and others on the direct route from Canada to NYC played a huge role during Prohibition in the 1920’s. Based on this theme, Jazz Music, Model T’s, Gangsters and Flappers are seen on the streets and in the businesses throughout the weekend, making a visitor wonder if they had walked through a time machine. Local restaurants offer $19.25 specials throughout the weekend with staff dressed for the era. Enjoy Friday Night’s Chase of the Bootleggers at area pubs! Saturday morning offers a car “chase” over Landon Hill, a notorious boot legging route, with over 25 vintage cars traveling from Pottersville to Chestertown. Saturday afternoon brings comedy at the Historic Carol Theater. Saturday night Speak Easy at the Panther Mt. Inn is complete with locked entrance door needing the password to gain entrance, Jazz Bands & Charleston Contests! All ages don costumes of the era throughout the weekend, so join us if you can—and don’t forget your flapper dress! Feds chase the Bootleggers! Starting 5 PM at the The Hub and then travelling to OP Fredericks, Odd Duck & The Bullhouse, ending at the Panther Mountain Pub. 3:30 PM Bootlegger Car “Chase” with Classic Cars and Re-enactments of the era! See our photo galleries for our 2014 pictures and 2013 pictures. The Rum Runners’ Weekend was honored to be recognized as winner of the Adirondack Park Excellence Award for Best Community Event (Spring / Fall).